MM is a 45-year-old housewife. She came to seek our help on 25 January 2013 regarding her recurrent menstrual pain and bleeding. In fact a week earlier she had been hospitalized for this problem. Listen to her story. Since 14 years old, MM suffered menstrual pain with blood clot. In our Oriental culture, problem like this is not something that family members would talk about! Furthermore, pain during menses is considered part of being a woman! So the problem that MM had was just left as it was. In the early 1990s she was told that she had ovarian cyst. She did nothing about it. In July 1992, she underwent a laparoscopic surgery to remove two ovarian cysts, each 10 cm in size. In 2006, MM suffered heavy bleeding and underwent another surgery. This time a 7 cm fibroid was removed. According to the doctor, her ovaries were clean. During the period between 2006 and 2010, MM started on Ayurvedic treatment for her recurrent bleeding problem. At first she received treatment in Kuala Lumpur (costing RM 300 per day). Later she went to Kerala, India for the treatment. According to MM, the treatment in Kerala was cheaper – RM 3,000 for a six-week treatment (inclusive of flight cost). In 2010, the pains and bleeding became more severe and she went to a university hospital in KL and underwent uterine arterial embolization (UAE). The procedure failed. She suffered severe pain and has to be knocked off by morphine. According to MM, My advice to anyone, never go for AEU! MM had a very high tolerance for pain and had never cried but UAE made her cry in pain! MM tried acupuncture. This helped. Her problem came on and off. Her periods became regular. In early January 2013, MM suffered severe bleeding and she was hospitalized. 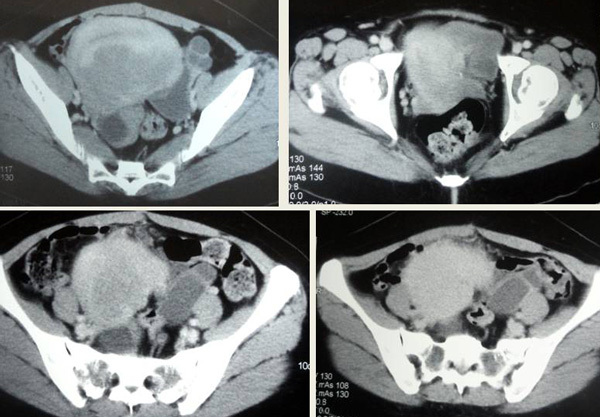 CT scan done on 18 January 2013 indicated a large uterus. There is a large posterior wall uterine myoma measuring 6.6 x 8.4 x 8.9 cm with central hypodensity likely to represent necrosis. It causes anterior displacement of endometrial and bladder depression. 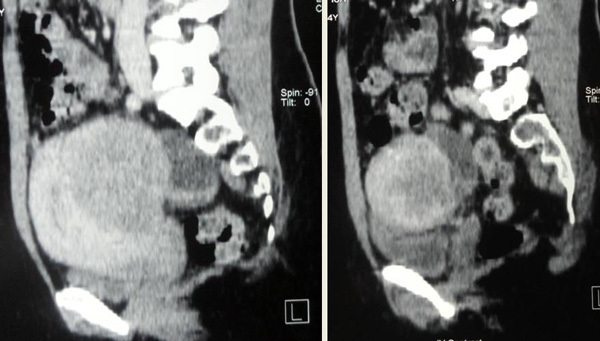 Bilateral ovarian cysts. Right ovarian cyst measures 3.2 x 3.7 cm and left ovarian cyst measures 2.8 x 5.2 cm. There is an suggestion of left hydrosalphinx. The doctor suggested that MM undergo a total hysterectomy. It was at this point that MM drove to Penang and sought our help. MM said she suffered pain before and during her periods and this was usually followed by severe bloating of the stomach. Having understood her problem, my reaction on that day was, We shall try our best. MM was prescribed PMS Pill, GY-5 and GY 6 teas. Two months later, 24 March 2013, a happy MM came to our centre again. Her long standing problems had been resolved. Listen to what she said. Chris: You took the herbs for two months. What happened? MM: No more pain and no more bloatedness. My periods were normal – 5 days. No blood clot. C: Before taking the herbs? M: A week before I came to see you, I had to be hospitalized due to severe bleeding and pain. That was why I did the CT scan. C: You mean when you went home and started to take the herbs, all your pain and bleeding were gone? C: I really don’t know what to say to you! You will have to continue taking the herbs for a while more. Did the herbs really help you? C: And you are happy now? C: Not too bad. You have improved!